Xue Rong’s wife and his concubine are on bad terms. When Concubine Zhao gives birth to a son, she’s forced to abandon the child at a distant place. An old couple, Zhang Yuanxiu and his wife, who make straw sandals for a living, find the baby and raise him as their own child. They give him the name Zhang Jibao. Thirteen years later, Zhang Jibao meets his birth mother at the Cool Breeze Pavilion, and Concubine Zhao takes him with her. The grieving foster parents fall ill, and visit the pavilion day by day, waiting for their son to return. Meanwhile Zhang Jibao becomes top scholar. Once he is on the way, and takes a rest in the Cool Breeze Pavilion. His foster parents recognize him, but the ungrateful Jibao refuses to know them, treats the old couple as beggars and gives them two-hundred copper coins. 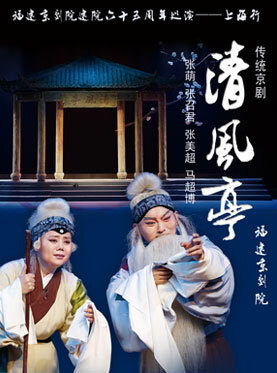 The embittered Mrs. Zhang throws the coins into his face, then the two elders commit suicide and fall to the ground in front of the pavilion. Moments later, the ungrateful Zhang Jibao is struck to death by lightning.